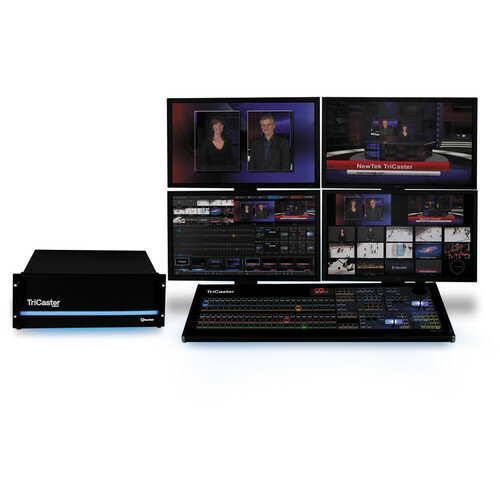 The Newtek TriCaster 8000 Advanced with 8000 Control Surface is a multi-camera, multi-input, multi-format 4 RU sized switcher system that allows you to simultaneously broadcast, project, stream, and record. It supports real-time, 8 M/E compositing and offers 3D and holographic virtual sets, transitions, and brand elements, and audio is adjustable for all input sources. Built-in IsoCorder technology allows recording up to nine isolated, simultaneous feeds during live production. You can instantly publish content to popular social media sites, upload to FTP sites, transfer to storage volumes/network locations, share clips and stills during production, or upload your entire show within minutes after production wraps. Custom memory presets and key commands allow you to streamline sophisticated operation sequences that are too complex for real-time action execution. An advanced control interface is built into the system, and the TriCaster 8000 Control Surface is also included. Its intuitive key layout, illuminated buttons, and durable design help you switch and control your broadcasts with ease. Create and store complex compositions and DVE-style motion sequences, with advanced configuration, positioning, keyframing, and effects. Apply any of the standard Adobe Photoshop blending modes between M/E layers for complex compositing and creative effects. Enjoy clear picture quality with video processing optimized for image sampling, downscaling, and warping. Generate animated transitions with complex video effects, like real-time cloth dynamics, 3D warping, and transformations. Integrated support for the Dante networking protocol from Audinate for interfacing with compatible audio devices over IP. Listen to production audio privately with a discrete stereo output jack and independent volume control for headphones. Identify, monitor, and manage switcher BKGD, DSK, and KEY layer video sources in real time with an integrated layer priority system and full-time, full-motion confidence monitors. Set up and store sessions with your user preferences in reusable templates-and jump right into your custom configuration for any production. Transform raw spreadsheet data from CSV, XML, or ASCII files into production-ready title pages that can be edited and updated in real time. Supports input of robotic pan-tilt-zoom cameras via serial and network protocols, including RS-232, RS-422, and IP. Monitor the multiple video signals from external inputs, internal sources, and outputs simultaneously with viewports built into the user interface display, and optionally extend monitoring to additional displays. Launch your session in any of the supported interlaced or progressive scan resolutions and frame rates, including HD and SD selections. Maintain signal quality from end to end with video and images processed at their native resolution-no up conversion or down conversion required. Utilize USB 3.0/3.1 storage media for high-speed file transfer and external capture workflows. NOTE: USB 3.0 and 3.1 Gen 1 feature a maximum throughput of 5 Gb/s. USB 3.0 and USB 3.1 Gen 1 are synonymous. Output video to a projector, monitor, digital signage, videoboard or other external display using one or more supplemental ports. Output a 'clean' version of the primary video mix without graphics and text overlays for simulcasting, archive, or distribution purposes. Output video to both analog and digital devices simultaneously with SDI outputs and analog outputs configurable for Component or Composite + Y/C. Purchase and install this optional software to customize live virtual set templates, import your own virtual studios created using your choice of design applications, or transform panoramic images into 360° virtual environments. Record your production to H.264 for distribution purposes with multiple selectable profiles. Optionally capture an audio-only recording of any selectable input or output with an independently configurable MP3 audio recorder. Add dedicated, single-channel capture, clip marking, and playback control with an optional TimeWarp replay controller. Configure and launch live streaming video to the web, using your choice of connection types, resolutions, and streaming providers, including multiple preset options and custom profile settings. Use any of a number of default streaming provider presets, including Facebook Live, Microsoft Azure, Periscope, Twitch, Ustream, YouTube Live, and more, or configure your own custom connection and designate as a preset. Switch video sub-mixes, create multi-source compositions, produce complex video effects, and configure live virtual sets for delivery to the production switcher or directly to output with multiple mix/effects (M/E) buses. Composite live video sources into complex virtual environments with multiple set locations and camera angles, real-time reflections, specular highlights, and optional animated lens flares. Minimize signal delay in IMAG installations with ultra-low throughput latency, further minimized with video sources genlocked and frame sync disabled on applicable TriCaster systems. Download and install free codecs for Microsoft Windows and Apple macOS platforms to enhance media file compatibility between your system and third-party software applications. Intuitive layout mapped to TriCaster 8000 user interface for maximum interaction. Practical lighting and backlighting for heightened visibility of control surface activity. Dynamically variable T-Bar lighting for visual feedback of effect status and progress. Direct access to TriCaster automation system with full support for user-defined macro triggers. Synchronized control of multiple production elements with versatile, multi-select delegate controls. Sleek, cockpit styling and design appeals to operators and executives.